In this installment of the critically acclaimed Mastering Camera Controls series, I’ll be focusing (get it?) 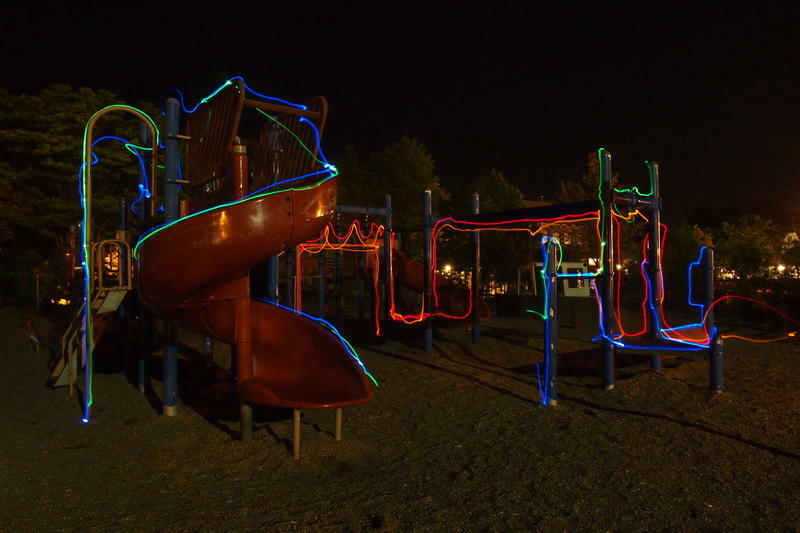 on light painting, or light graffiti as some refer to it. 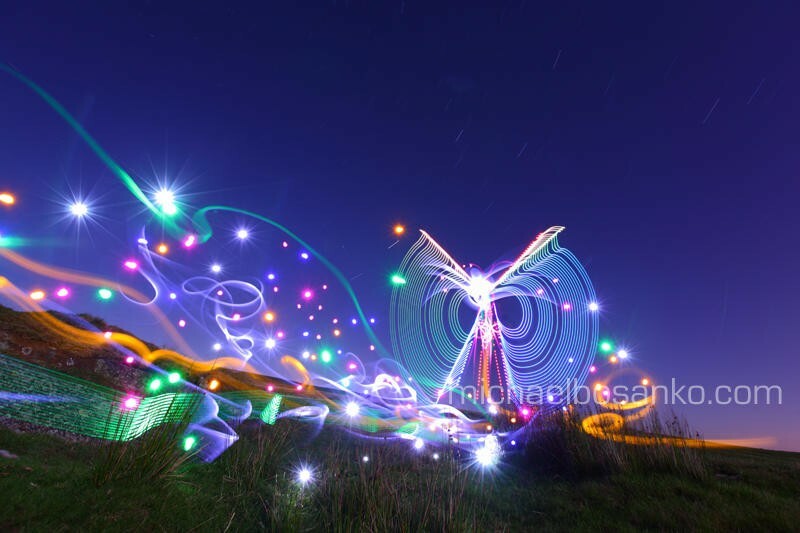 Light painting is a highly artistic way for photographers to express themselves, and it’s fairly easy to accomplish with the right set of tools. Who knows–you may find yourself producing work like my favorite photographer, Michael Bosanko, whose light creation is featured above. Keep in mind that the above image is devoid of Photoshop work and was naturally crated by a man, a camera and an arsenal of colored lights. Oh, and a super long shutter speed, but we’ll get to that in a moment. 1. Find an ideal background for night shooting. If you plan on making your light figures the centerpiece of the picture, then opt for an open space. If you plan on highlighting structures that are already there, go for something like a playground or parking lot filled with cars. The possibilities are endless! 2. Set your tripod on solid ground, making sure there is absolutely no play in the legs. Since the shutter will be open for such a long time, any minor jolt to the tripod will result in blurring. 3. Mount your camera to the tripod and frame your shot. 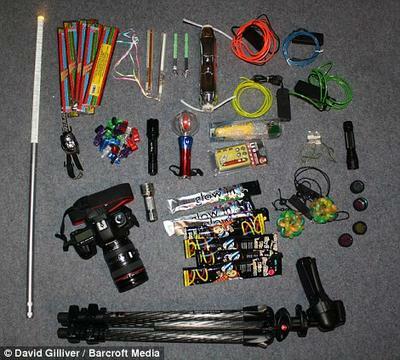 If it’s difficult to see, have a friend outline the perimeter with a flashlight or use your own from behind the camera. If it helps, use markers like sticks or rocks to indicate the perimeter of your camera’s field of view. The closer you get to the lens, the narrower your playing field becomes. 4. Power on the camera and head into Manual mode. Most decent DSLRs have shutter speeds that dip down to 60-seconds. If you plan on taking more time with your light creations, you’ll want to use Bulb mode with a wireless shutter control. Bulb mode allows you to open the shutter for as long as you want by pressing and holding the Shutter Release button. However, when you let go of the Shutter Release button, the shutter closes. With the right wireless shutter control device, you can press the button once to open the shutter and press it a second time to close it. This way you can press it once, head out into the frame to take your time with your light creations, and press it a second time as soon as you finish from out in the field. 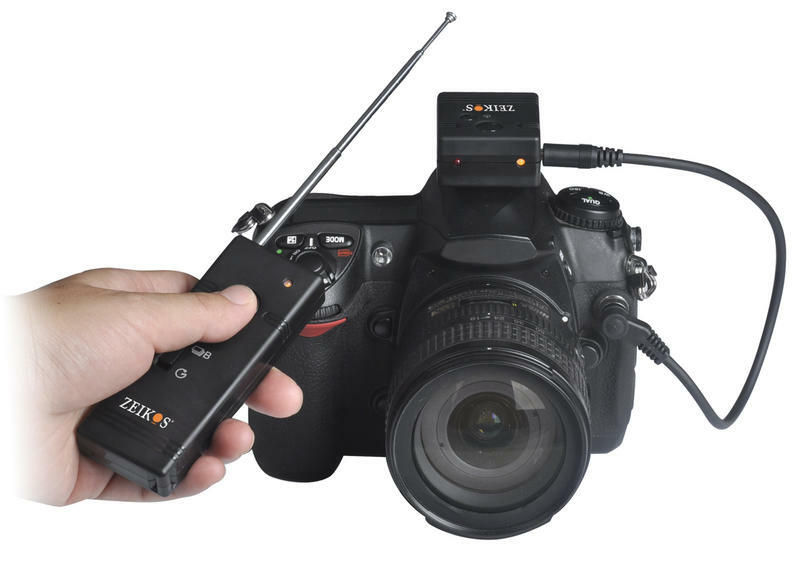 You can also get a tethered remote shutter that connects to the camera and have someone hold down the Shutter Release button while you paint. If you don’t have anyone to help you or your camera does not have Bulb mode, set the shutter speed to the slowest possible duration available on the camera, which is usually 60 seconds. 5. Set the ISO low, to around 100 or 200. Anything higher will increase noise during the long exposure, and you don’t want that. Also, close the aperture down to about an f/18 or higher in order to keep objects in the background and foreground focused equally. Focusing is difficult if you don’t have someone to stand in the frame with a flashlight. Without that luxury, try to illuminate an object in the frame with one of your lights in order to attain a proper focus and lock it in. 6. If you’re not using a remote or wireless shutter control with Bulb, set the self-timer. You want to use the self-timer because it gives you enough time to take your starting position with the lights, and it reduces the chances of you jostling the camera by pressing the Shutter Release button on the camera manually, which inevitably leads to blur. 7. Now it’s time to paint. As soon as you hear the self-timer beeps end and that shutter snap open, it’s time to bust out the lights. 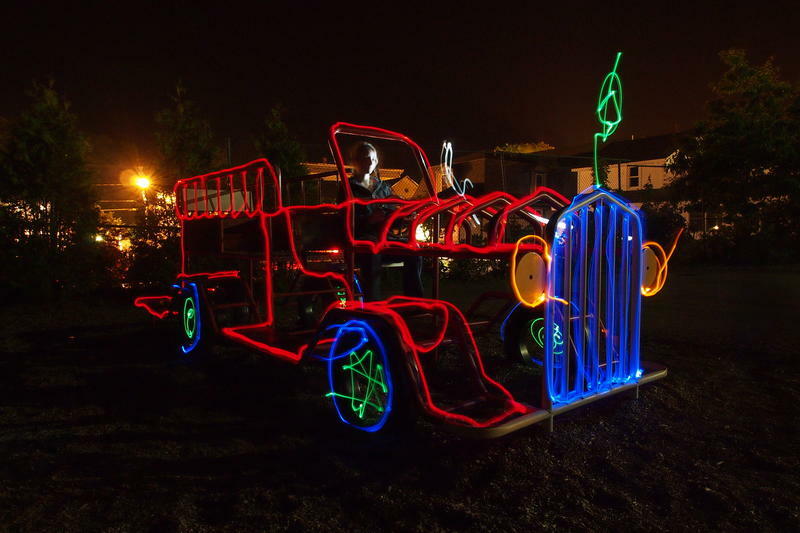 At first, light painting will seem nearly impossible. Here you are, waving an LED light in the black of night without any way to see what you’re doing. Rely on your imagination to create creatures, objects and scenes. Practice writing your name. Experiment with shapes. Take risks. Also remember that the camera will record any light that hits the lens, so be sure to hide the light or turn it off in areas where it is not needed. 8. Review each shot on the LCD to make sure you’re framed correctly and that you’re manipulating the lights into the shapes and designs you intend on creating. I shot the two pictures below with the Olympus PEN E-P3 at a 60-second shutter speed. I had three people helping, each with cheap dollar store LED lights strapped to their hands. 60 seconds seems like six fleeting seconds when you’re scrambling around to make light designs, and we had to make a few practice runs in order to get a good shot. You’ll also need a lot of time on your hands–each picture takes 60 seconds to shoot and another 60 to process in the camera, depending on your camera. But those were amateur efforts compared to Michael Bosako’s photography. Be sure to head over to his website to check out more of his ingenious work. In the meantime, I hope this guide helps–leave any questions in the comment section!